This one has been a while in the making. Abby and I were baking a batch of cupcakes every weekend there for a while, and then Christmas happened. And New Year. And then going back to school and work just made us both really tired. And then there were the Star Wars movies to watch … over and over again! Anyway, we finally had some time this weekend where both Abby and I felt energetic enough to bake together again. Now, I’m quite happy baking when I’m tired, but Abby is often more content just reading or drawing or doing some other arty-crafty thing by herself. Or playing with the cats. 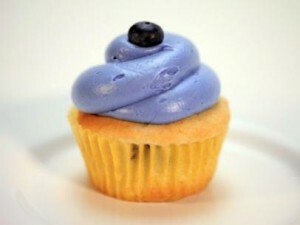 But all the stars aligned and so I bring you ‘Lemon blueberry cupcakes’. Again, a recipe that was from Cupcake Wars. Actually, literally, this was the recipe that was on Cupcake Wars – we found it on the Food Network site (see here). But, me being the special snowflake and all, needed to make it gluten and dairy free. So, we used gluten-free all purpose flour, shortening instead of butter, and unsweetened plain coconut milk yogurt instead of sour cream. I was a bit dubious as to how it would all work out, but you can judge for yourselves! On the left is our creation – on the right is the ‘official’ looking cupcake from the Food Network site. So they look a little different. Abby and I had a few issues with the cream cheese frosting – I don’t think that non-dairy cream cheese works totally the same as ‘normal’ cream cheese and the frosting took a huge amount of powdered sugar to thicken up to the stage we got it. But the texture of the cake was really nice and tangy, and we added some blueberry/lemon jam in the frosting, just to highlight the flavors a bit more. This one was a bit of a stretch to make into a fruit of the Spirit. 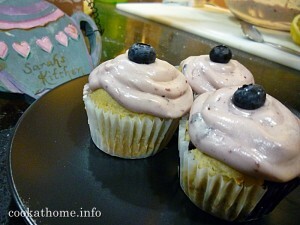 Abby calls it the ‘patience’ cupcakes because ‘it takes a long time to grow blueberries’. Does anyone know if that’s true or not? Even if it isn’t, we definitely required patience (and an emergency trip to the grocery store for more powdered sugar) in making at least the frosting! So, Abby’s now got the idea of making all the fruit of the Spirit cupcakes we’ve made into full cakes. Wish us luck (and any friends who are near us, be prepared for many gifts of cake …!). Until next time, enjoy cooking at home … with kids! 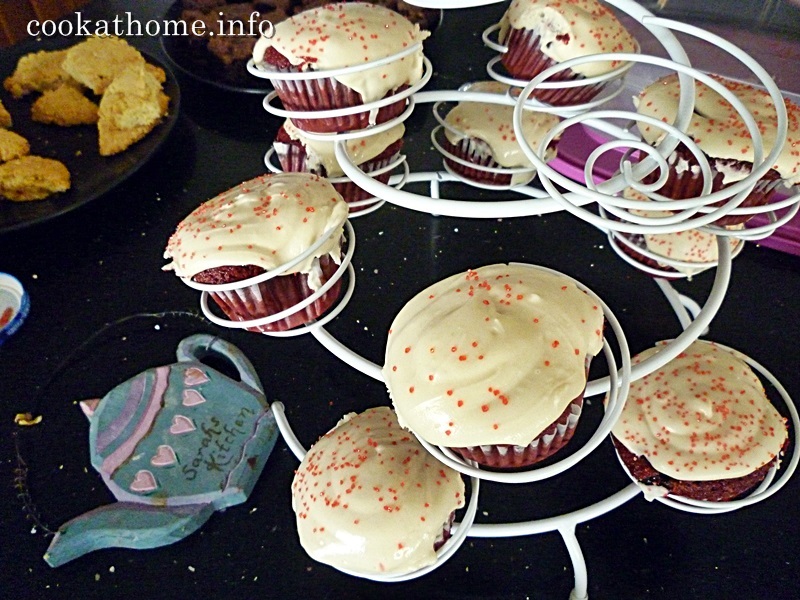 It was the weekend again … and another batch of cupcakes. Originally we were going to do a lemon blueberry cupcake (I think) but I found some blood oranges in the grocery store and bought them. It was an accident – I thought they were normal navel oranges, until I had one and found a rather pinkish color. Abby saw me eat the orange and said ‘now we can make the blood orange cupcakes!’ (imagine that said at the top of her very excited voice!). So, we made the chocolate orange cake recipe (see the full recipe here) – the worst part of the whole recipe is cooking the oranges at the beginning. Unfortunately this time I don’t think I left them in the saucepan for long enough and we had some rather chunky pieces through the batter. But they turned out really well – like those Jaffa candies that we grew up with in Australia – anyone know of an American equivalent? Abby didn’t really want to go overboard with decorating this weekend … wait, what happened to my decorating daughter? Anyway, she just wanted to have some chocolate buttercream frosting and she was happy with that. But I suggested some gummy worms we had in the cupboard from a failed worms in the mud experiment (let’s just not talk about that weekend of baking failures, shall we?). And then I asked Abby what Biblical reference were we going to have with these. And she came up with Joseph. Let me explain. Joseph had a coat of many colors (hence the gummy worms) which was covered in blood (hence the blood oranges) by his jealous brothers. For those of you who would like to remind yourselves of the story, look up Genesis 37 and following. I thought it was kind of clever, so we stuck by the name. And they tasted great (apart from the big chunks of orange zest in them). Abby did really well with the buttercream frosting this time around, and I think they looked sweet with the gummy worms on top! I think we’re going to have a break from cupcakes next weekend. It will be just after the indulgences of Christmas, so I don’t think we will really need to make more sweets to have in our house! But happy to hear any suggestions for other flavors, just in case Abby loses her list, or gets bored with the Cupcake Wars flavors! Another in the series of the Fruits of the Spirit cupcakes. This week’s installment – Love. Well, it originally came from a red velvet cupcake winning entry on Cupcake Wars (obviously), but what else could this be, but love? I found a recipe for gluten-free red velvet cupcakes (which was basically a normal recipe but using ‘gluten free’ all purpose flour), and Abby made some cream cheese frosting (non-dairy of course). And funnily enough, there weren’t that many leftovers! Everyone left feeling full and satisfied and we had a great time of chatting about life, death and everything in between. Thanks for reading this week’s adventures cooking with Abby – stay tuned for the next exciting episode of our own Cupcake Wars coming up! Another weekend. Another batch of cupcakes. This time it was my idea. Based on the fact that the cereal I had specifically bought for Abby … she didn’t like. This was a cereal that was gluten, dairy, nut and other allergen-free, with a lot less sugar than the normal cereals. Abby said they tasted like Fruit Loops … and she doesn’t like Fruit Loops (what kind of kid doesn’t like Fruit Loops, I ask you? Maybe it was the lack of sugar?). Anyway, she wasn’t going to eat them. And Henry tried them, and didn’t like them either. I tried them and liked them. Grant tried them and liked them. Maybe they were geared more towards adult taste-buds? 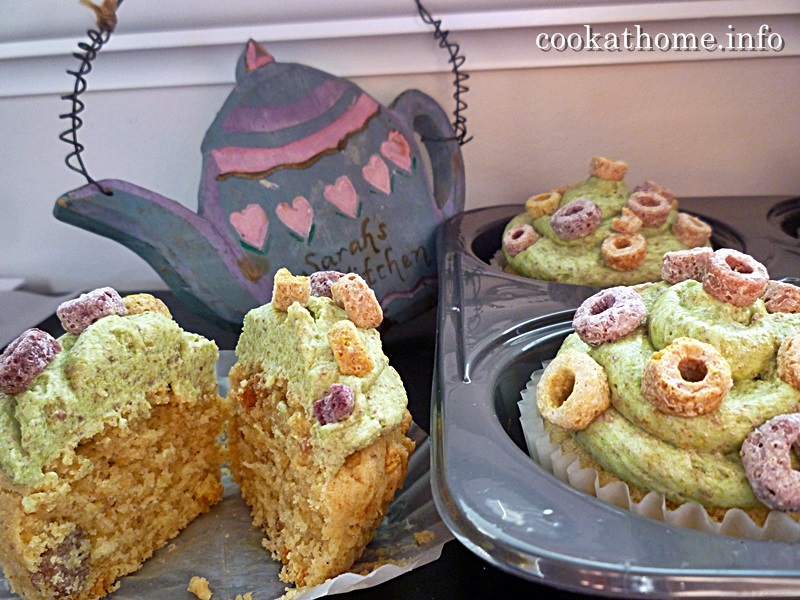 So I googled ‘uses for leftover Fruit Loops’ and found a recipe for Fruit Loop cupcakes (who would’ve known others would be in the same situation as me?). So this weekend I said to Abby that we’d try this recipe, use up the leftover cereal that she didn’t like, so she could go for it with cereal she does like. Mind you, she’s been having Grant’s Weet-bix all week, which is probably way more healthy than anything else she could have had, so I’m not sure I want her to go back. Even though the new cereal I did get her, was lower in sugar. Confused yet? Welcome to my brain this weekend!! Anyway, this recipe called for a whole pile of different extracts, that I just couldn’t be bothered going out and buying, for a teaspoon-ful, so we just used vanilla instead. They turned out … ok. A little dense, but ok for what they are/were. The frosting is a mixture of our normal buttercream frosting, with some more crushed up cereal and topped with the cereal as well. I don’t think this recipe will make a re-entrance in our cupcake list, but it was worth a trial. And the recipe only made 12. And we’re giving 4 of them away tomorrow. So that leaves enough for Grant to take to the men’s Bible Study on Monday and that’s it for them! Hopefully you understand where the Bible context comes from – Holy = hole-y? Yeah, I know it’s a stretch, but it was Grant’s idea. So next week, should be totally different and hopefully have a bit better success. I think it’s supposed to be red velvet cupcakes, or something like that. Wish us luck! Until then, enjoy cooking at home … with kids! After last week’s … interesting (!) 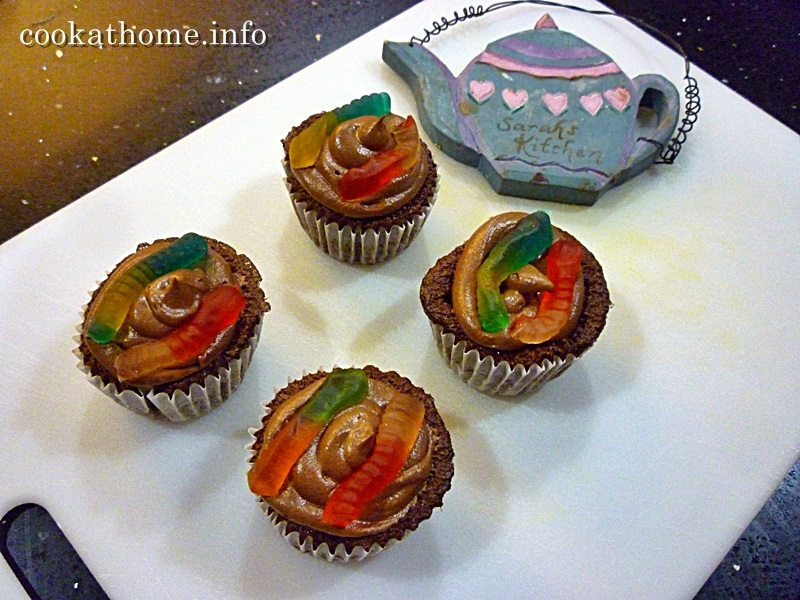 concoction of cupcake (read here), Abby and I thought we’d get back to what we knew best. Cupcakes. Chocolate cupcakes to be exact. And what could we add to chocolate to make it awesome? Why, raspberries of course! 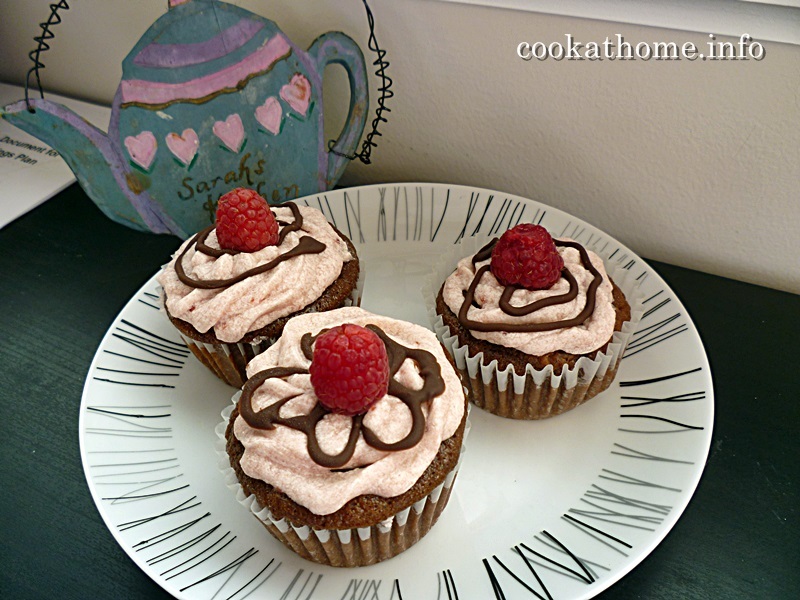 This was another in our series of converting a cake recipe into cupcakes – and these worked really well. The recipe originally came from Grant’s mum (thanks Nanna!) and you can find it here. This is a really moist recipe, mainly because when I was given the recipe, Grant’s mum doubled some of the ingredients but not the rest, as she always used to make a double batch. I haven’t changed the proportions from what she gave me though – I love it! And this one was gluten-free, but I did use normal butter and normal milk (and tested fate with some Lactaid). I never know just how many cupcakes a standard cake recipe will yield – this one ended up with about 29 in total. Luckily we had people around for lunch that day, and Grant took the rest to the Men’s Bible Study, so win-win all around! For the ‘kindness’, well, this was a long stretch, but Abby says it was because the chocolate and raspberry are kind on your tongue (?!). But it’s the latest in the series of the Fruits of the Spirit cupcakes, so you can take this explanation or leave it! I think they look awesome. I think they tasted awesome. And so did everyone else who tried them. Abby says they were our best tasting cupcakes yet. Watch out next week …! Actually, next week we’re going to try something to use up some leftover cereal. Apparently, my kids don’t like cereals that taste like Fruit Loops – go figure! Well, they were gluten-free and dairy-free and have half the amount of sugar as normal Fruit Loops … but I can still crush them up into cupcakes. Stay tuned, hold your breath, and tune in next week! This week’s cupcakes were … interesting. Abby’s idea was to have savory cornbread muffins, with a savory cream cheese frosting, again from one of the winning cupcakes on Cupcake Wars. Yeah … it was a winner on there, but I don’t think we followed what they did quite close enough. And then the frosting. I had some dairy-free chive and onion cream cheese that I had bought to have on my gluten-free bagels (there are some advantages of living in the US and access to all these sorts of foods!). So we used that, and added some dairy-free margarine and then … some powdered sugar to make it into a normal cream cheese frosting. I think that was our downfall. I think I should have watched the episode to find out how to keep the frosting savory. I just don’t think it worked. But, having said that, I handed them out to the ladies at my Bible Study and 3 out of 4 who took them (after cautionary warnings from me) said they liked it. Only one ended up throwing it into the garbage! 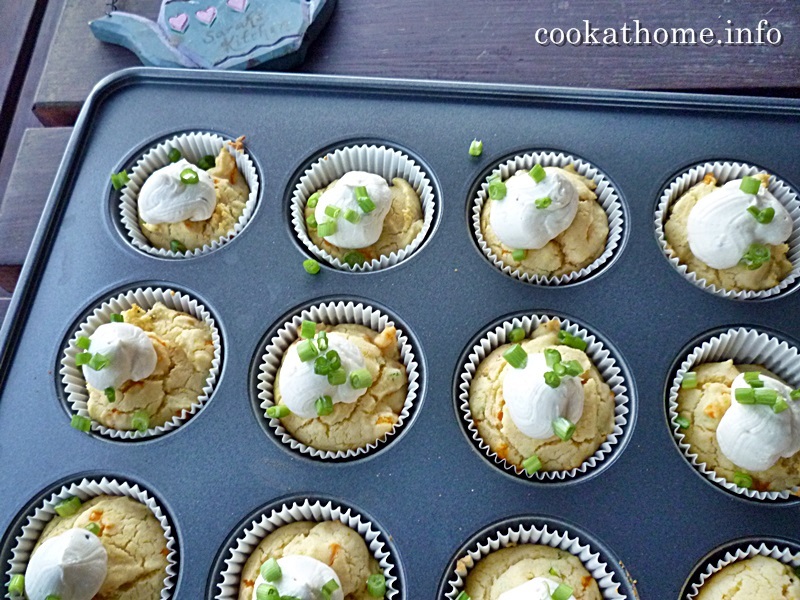 savory cornbread muffins are awesome! savory cream cheese frosting … needs more work. I found out later that Abby thought they just whipped the cream cheese and dolloped it on top – that would have worked! And why they’re called Ruth … this is all part of Abby’s attempt to bring the Bible into our baking. Check out Ruth 2:2 (NASB) – And Ruth the Moabitess said to Naomi, “Please let me go to the field and glean among the ears of grain after one in whose sight I may find favor.” Some translations use ‘corn’ for ‘grain’ … I thought it was a good reference! Hope you enjoyed reading about our … ahem … failure. Hopefully our next cupcake attempt will reap (!) better results! Another in the series of Abby’s cupcakes. 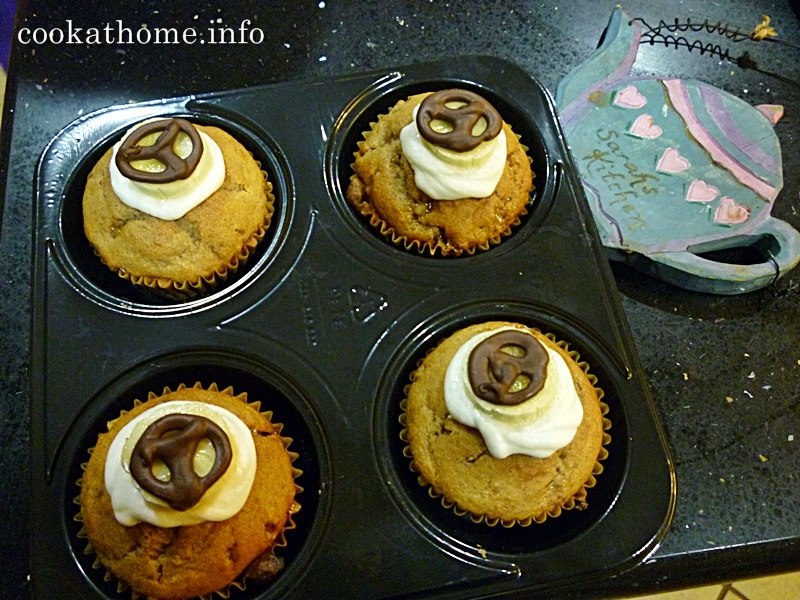 Banana toffee cupcakes, with a peace symbol on top. Sounds simple, doesn’t it? Well, we learnt a lot about toffee this weekend! We tried to make toffee ourselves. Looking at recipes on the internet it looked pretty easy – mix equal portions of butter (or margarine) with sugar and heat until a certain temperature, then allow to cool. Sounds simple? Well, we burnt the first batch. And then we couldn’t be bothered trying to make another batch, so we bought some toffee bits from the grocery store. These bits we put into the cupcakes, which we made using my banana bread recipe (see here) and just added it ‘until it looked right’ (thanks Mum!). The cake part of the cupcakes were awesome. But then Abby wanted a toffee buttercream frosting. Buttercream frosting we think we’ve got reasonably good now. 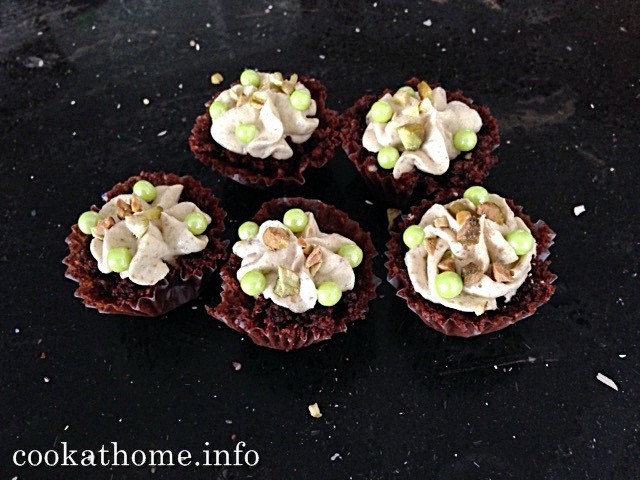 I thought – well, we often melt chocolate to put that in frosting, lets try that with toffee. It didn’t work. It didn’t get creamy, it didn’t get spreadable, it just got warm and into one gooey mess. So we kind of crushed it up and put it in the frosting. And then I realized that piping frosting with ‘bits’ in it leads to the tip getting clogged, and then the bag splitting due to the pressure. Abby’s plan was to pipe peace symbols out of the melted toffee as well. That didn’t happen (see above paragraph). So we got out the old faithful chocolate chips, melted them down and then Abby went to town piping her peace symbols. Some worked, some didn’t. They tasted pretty good, although we ended up taking the banana slices off the top after a day or so … would have probably been better with dried banana. We gave some to Abby’s karate teacher for his birthday and he was quite impressed (haven’t heard whether he ate them and liked them yet, though!). Grant took some to his Bible Study and apparently one of the guys ate 3 of them. So all in all, it was a learning experience for us, and a win for everyone who had them. Hope you enjoyed reading about Abby and my cooking at home together … I’m a little scared at the next installment from Abby’s sheet of cupcakes. Tune in to hear how we went! Another weekend, and another batch of cupcakes, dreamed up by Abby, based on some concoction that did well in Cupcake Wars. So this week we made citrus almond cupcakes. The cake recipe was based on my honey almond cake recipe (see here) that I’ve always had great success with. We added in some orange zest, thanks to a suggestion from one of my friends who had some of the original cake (thanks Jess!). For the frosting, we made a simple buttercream frosting, with some orange juice in it, then decorated with colored frosting, candy pearls and a sliced almond. Abby called them her ‘pumpkin’ cupcakes. Well, actually no, Abby wanted to relate these to one of the Fruits of the Spirit (Galatians 5:22-23), so because eating oranges gives people joy, these were the ‘Joy’ cupcakes. See for yourself! I think they look pretty cool! And they tasted awesome as well! Every time Abby watches the Cupcake Wars, I get a little scared at what she would like to do next. 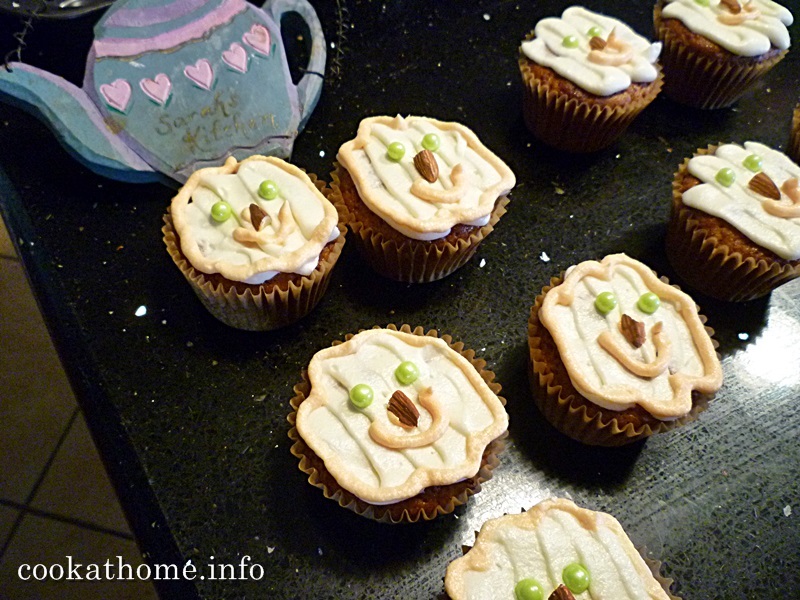 On her list, that I can remember, includes things like savory cupcakes with jalapeno cream cheese, green tea cupcakes …. eeek! Wish me luck you all! Hope you enjoyed reading about my adventures in the kitchen with Abby. Remember if you like this website to pass it onto your friends and family, and get them to sign up if they want the recipes as soon as I post new ones! 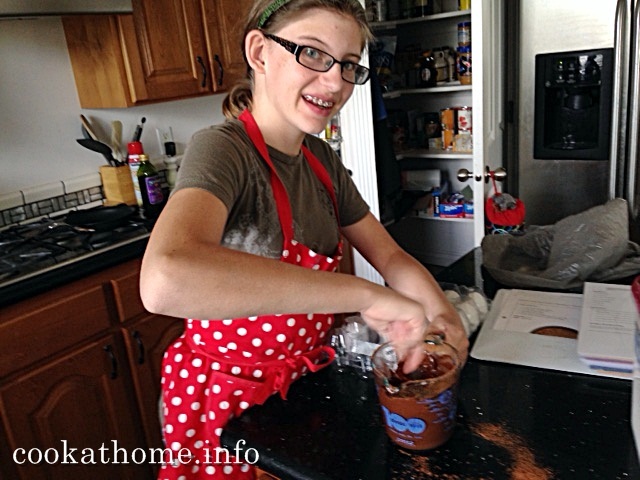 It’s been a few weeks since my last ‘cooking with kids’ post, but rest assured we’ve been doing lots in the kitchen. I just haven’t had the time to post either the blog, or the photos! Abby is still really keen on making cupcakes. Basically turning most of my cake recipes into cupcakes. And obviously making them gluten and dairy-free for little old me …! So this week, she wanted to do a pineapple mango cupcake that she had seen on … you guessed it … Cupcake Wars. But since we didn’t have most of the ingredients to do it exactly like on the show, we adapted it. And had lots of fun doing it. We took the lemon polenta cake (recipe here) that we had recently adapted with orange instead of lemons and added buttercream frosting (see here) because we knew that worked well as cupcakes. This time, instead of the lemon zest in the cakes, we chopped up some pineapple and added a bit more juice, and a little bit more cornmeal/polenta to make sure we had the right consistency. The frosting was meant to be a mango whipped cream with a decoration of a white chocolate fondant rocket. I thought that was slightly out of our range of decorating skills and expensive to try to make gluten and dairy-free. So we improvised with a white chocolate buttercream frosting (using some sugar-free white chocolate syrup that we’ve found here), and then cutting some dried mango pieces into suns. 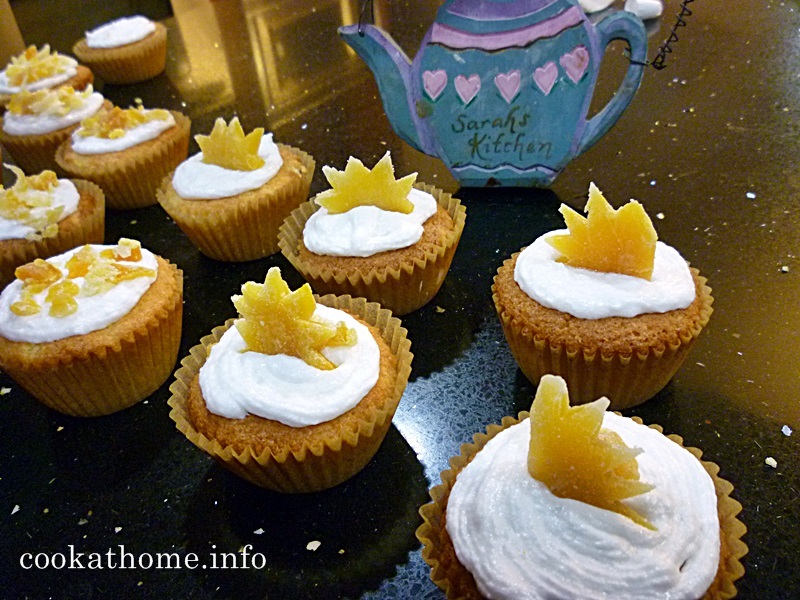 So, you may ask, why are these called ‘let there be light’ cupcakes? Well, Abby is really keen on our food truck dream and she wants to help make cupcakes for it. And all of her cupcakes she wants to relate to a verse, or verses in the Bible. Hence, the mango suns (instead of the white chocolate rocket) and this was tagged as when God created the sun and the moon (Genesis 1:14). Hence – ‘let there be light’ cupcakes. There is a postscript to this story. These cupcakes we made for my ladies Bible Study group that meets at my house every week. One of the ladies is also gluten and dairy intolerant, and so are some of her kids. She took two of the leftover cupcakes (yes, we didn’t eat all of them in one night!) 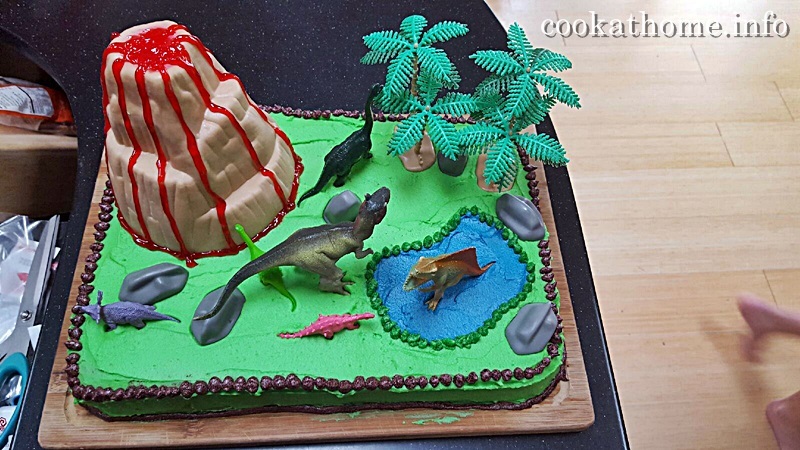 home for her kids and her son loved his so much that he wanted it for his birthday cake. So Abby and I offered to make the cake and the frosting, and Jenn took on the task of decorating it. Awesome job isn’t it? Haven’t yet heard how it tasted, or how it was received by the rest of the family, but I was impressed by how this kind of snowballed. And … I just found out that another of my friends is using the lemon polenta cake recipe and making it to bring to dessert for a lunch. Amazing … and I feel very humble that a small little website like mine, and a small little recipe, could gain so much enthusiasm and joy. And that’s what I do this for – to make other people happy. Thanks for reading. Remember, if you like what you read, or see on this website, you can subscribe to get new recipes delivered to your inbox as soon as they are published. I’ve got a number of them that I’m going to be posting in the next few weeks, so you have been warned. And tell your friends and family … and be joyful in the Light! Until next week, enjoy cooking at home … with kids! The end of September is always a busy one for our family. Grant and Henry’s birthdays are 8 days apart. This year, I asked each of them what sort of birthday cake they’d like … and this year they both came up with rather elaborate ideas (which will be the subject of a post next week after Henry’s birthday!). Anyway, as I was making the first part of Henry’s cake, I had some batter left over from the chocolate base part of it, and suggested to Abby that she use it to make some cupcakes … her favorite. This was part of an awesome Mummy-Abby afternoon that included a Mexican lunch followed by frozen yogurt, then baking followed by chilling out watching a kids movie. I had a really good time and hope this was one of those moments that stick with Abby when she starts going through her rebellious teenage years. So the base cupcake was adapted from the chocolate olive oil cake recipe (see here). We didn’t have olive oil, so we used canola oil instead. Then Abby wanted it to be a little ‘spicier’, as according to the Cupcake Wars show she’d seen, so we added a pile of cinnamon to it. We tried to make mini cupcakes, but didn’t spray the pan too well and couldn’t get them out of the tin without breaking the tops off. We used them as experiments, and then the ones we were able to extract without breaking the tops off, we gave to Grant to take for his men’s Bible Study session. I think they look pretty impressive! But since we used actual butter, I haven’t tried any with the frosting. I HAVE tried the cake and will update you with how Henry’s birthday cake to end all cakes ends up next week. It’s going to be epic! But I am so proud of Abby and look forward to her next creation idea (which she has lots of! ).